With iOS 11 now available for everyone, you’re probably wondering how the redesigned Apple App Store is affecting your app marketing performance. Okay, okay, “wondering” is likely an understatement. Let us be the first to show you how to use iTunes Connect to collect and analyze your app store data and know when and how to pivot your app store marketing efforts accordingly. 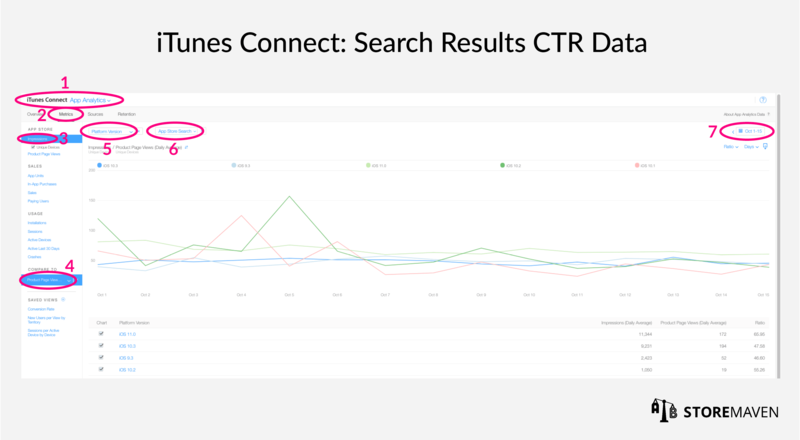 The only way to know the impact the new iOS 11 App Store is having on your app marketing performance is by using iTunes Connect to segment your traffic into three distinct sources for analysis: search traffic, browse traffic, and referral traffic. After segmenting your traffic sources, there are three metrics that should be analyzed in order to identify the impact of iOS 11 on each traffic source. These metrics include impressions, click-through rate (CTR), and conversion rate (CVR). In this 3-part post series, we provide a step-by-step guide that will help you segment and analyze your traffic sources so that you can optimize your app store accordingly. 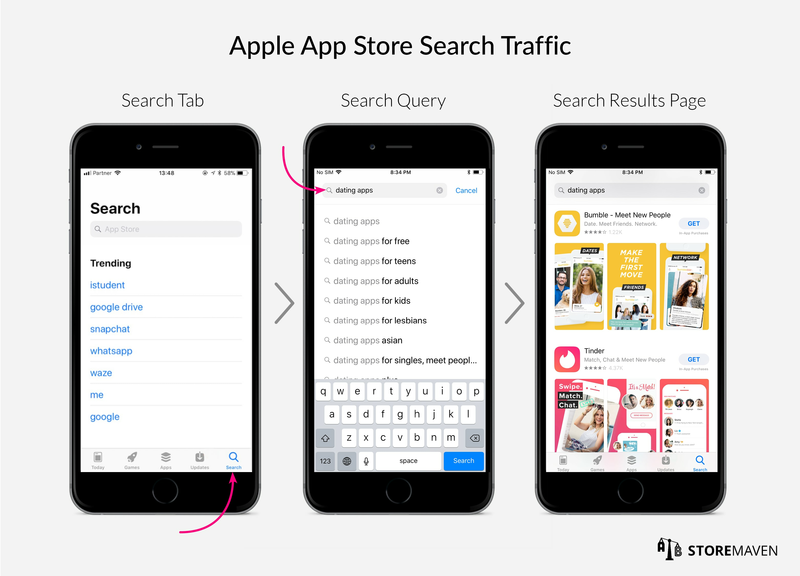 Simply put, search traffic includes all visitors that arrived to your App Store Product Page after initiating a search for your app—or an app that meets similar needs—and clicking your app in the Search Results Page. Users initiate this app store search by tapping the Search tab in the Navigation Panel, entering a query (one word or even a sentence), and tapping the search button. The user is then directed to the Search Results Page where a variety of apps are ranked according to an algorithm developed by iTunes. 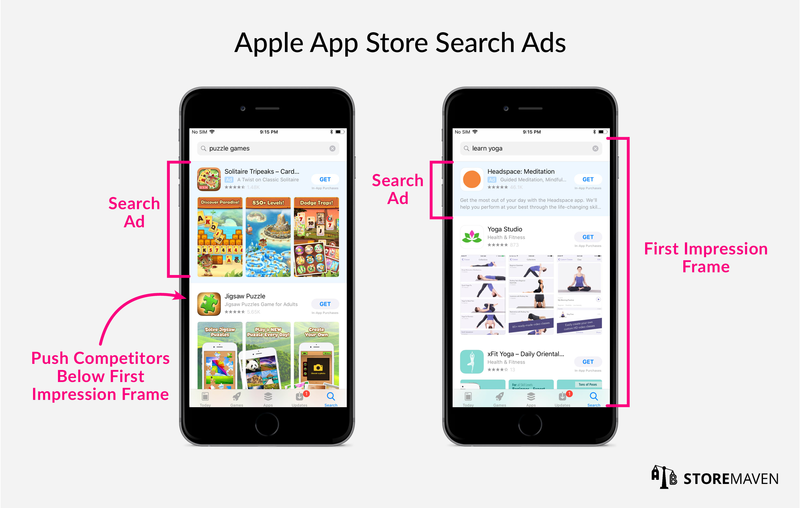 This algorithm is designed to show users the most relevant app at the top of the Search Results Page and the least relevant app at the bottom. Optimizing your app in the Search Results Page is another aspect of App Store Optimization (ASO) that has to do with keyword optimization. That is, optimizing your keywords so that users can easily find your app in a search. This is fundamentally the same as web Search Engine Optimization (SEO). Regardless of how your app is ranked, once a user sees your app in the Search Results Page you have increased your reach through search traffic and your goal is now to convert users. To convert a user means to get them to download your app. As shown above, there are two ways to convert users. A user can either click on the install button directly from the Search Results Page or they can click through to your Product Page and install there. Conversion optimization is another aspect of ASO that has more to do with optimizing your creative marketing assets in a way that helps users easily understand how your app meets their needs. In order to analyze your search traffic, you have to understand the significance behind three important metrics, as well as know how to collect respective data for analysis. 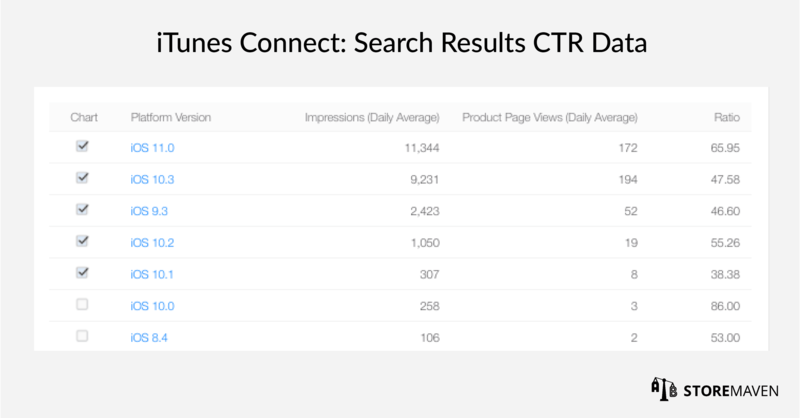 These metrics are depicted below and include impressions, click-through rate (CTR), and conversion rate (CVR). 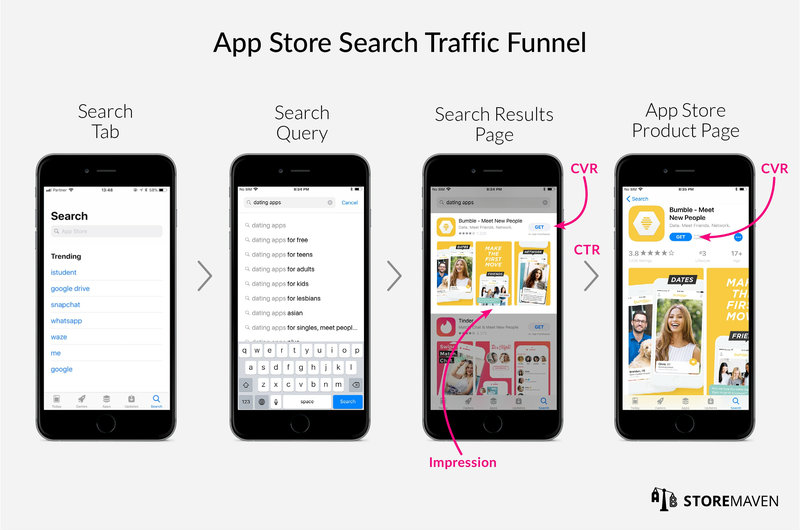 An impression, within the context of search traffic analysis, is an indicator of your volume of organic search traffic within the App Store. More specifically, it refers to the number of times your app was seen in the Search Results Page. Why Do We Predict Your Impressions Will Be Affected by the New iOS 11 App Store? The underlying motive and the actual process that users undergo in order to search for and discover your app has not changed due to the iOS 11 upgrade. What has changed, however, is the way apps are shown in the Search Results Page and, in turn, the likelihood that users will be exposed to your app. 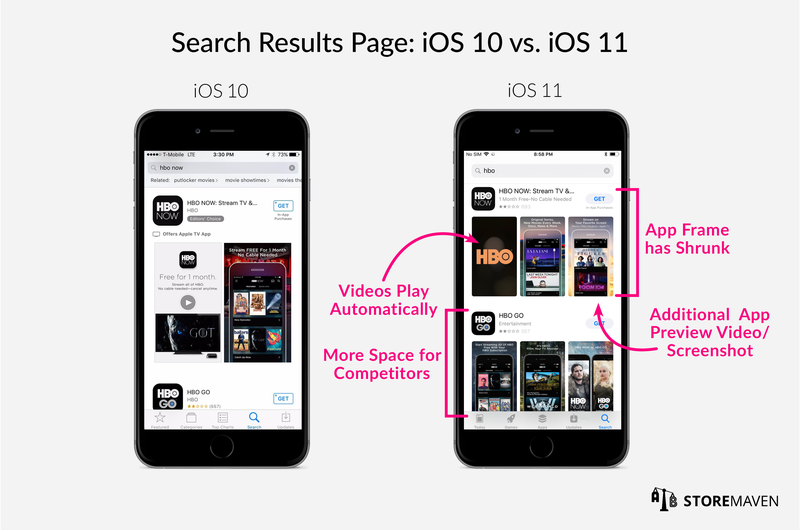 The most significant changes that have been made to the iOS 11 Search Results Page, which we predict will impact your app performance are depicted below. Notice how the entire App Frame has been reduced in size in order to provide more real estate to competitor apps. In the comparison above, you can also see how the second app is now more visible. The new Search Results Page is also more visually appealing with up to three App Preview videos /screenshots that can be seen in the portrait format. Videos now play automatically, creating a more interactive user experience. These App Store updates all inherently encourage users to scroll. What does that mean for your search impressions volume? Well, if your app is ranked as the first app in the Search Results Page for a majority of related queries, we hypothesize that your impressions volume will not be affected. If your app is ranked the second or subsequent app in the Search Results Page for a majority of related queries, there is now a higher chance that the user will scroll down and see your app. The first step in analyzing your app store analytics is to look at the trend of your total search traffic (all bars in the graph). Then identify the time period when you first received iOS 11 user traffic. 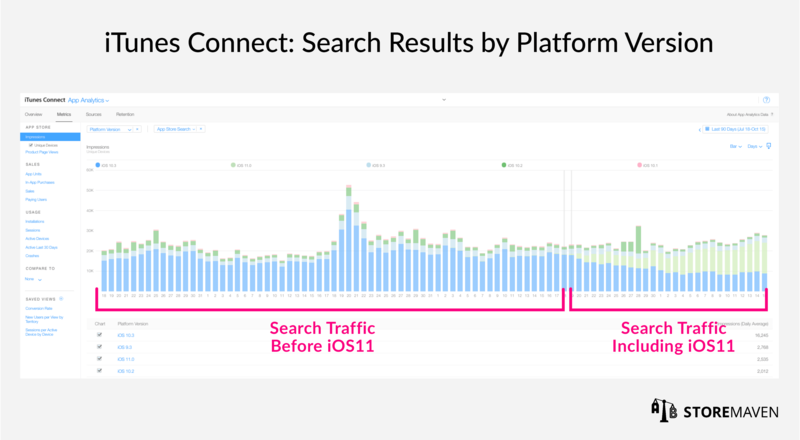 Compare search traffic before iOS 11 to search traffic including iOS11. In the example provided above, we do not see a significant change. The next thing to explore in Apple app analytics is your breakdown of Platform Version traffic. Since developers can only have one iOS version of their app store, it is important that you continuously track which version brings you the most traffic. This will help you determine which version to optimize for. Beware that the adoption rate for a new iOS version can be rapid. If you have seen no change in your total search impressions volume, this signifies that for a majority of related search queries, your app is likely the first app that appears in the Search Results Page. Since videos play automatically when you are the first app in the Search Results Page, now is an optimal time to test your App Preview video assets. For video testing ideas, read this and this. 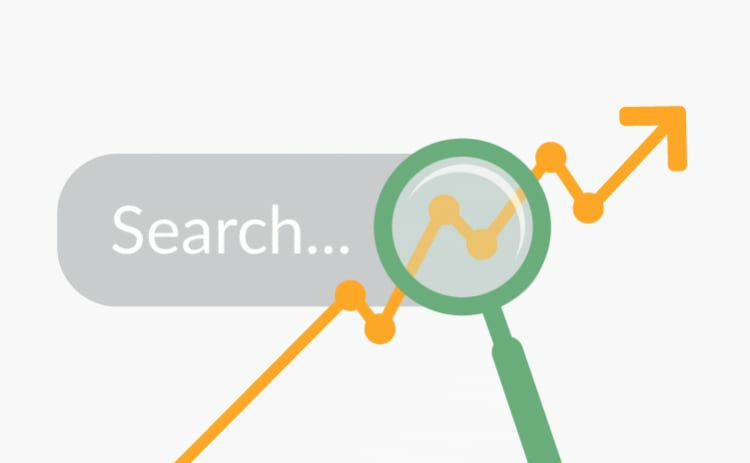 If you saw an increase in your total search impression volume, this signifies that for a majority of related search queries, your app is likely ranked second or subsequent in the Search Results Page. Since you know that for a majority of related search queries, your app is not ranked first in the Search Results Page, you can leverage Search Ads to enjoy an even better impression rate and simultaneously push your competitors below the First Impression Frame. 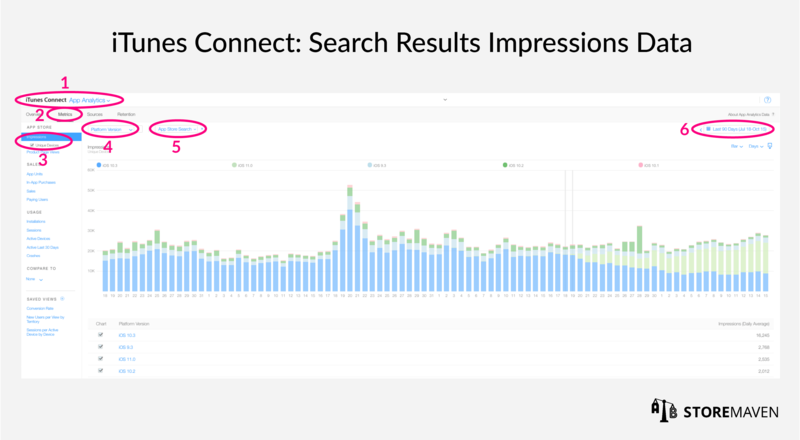 If you saw a decrease in your total search impressions volume, this can be a result of having a low rank in the iOS 11 Search Results Page for a majority of related queries. Your low ranking can be a result of the ways in which Apple has optimized their search engine. One way Apple optimized their search engine for iOS 11, was by reducing the number of app title characters from 50 to 30, no longer permitting developers to jam-pack keywords into their title. Additionally, the subtitle (up to 30 characters) now serves as a new asset that developers can use to describe the utility of their app and encourage users to download. Since Apple has begun indexing keywords found in the subtitle, the subtitle can simultaneously be used for search optimization. Finally, ratings have changed in iOS 11. Ratings and reviews influence how your app ranks in search and can further encourage users to engage with your app when seen in the Search Results Page. In iOS 10, ratings and reviews were reset upon submitting each new app version. In iOS 11, developers can now choose whether ratings and reviews are reset. Developers can also now respond to customer reviews in order to directly address feedback, questions, or concerns. In this case, the customer is notified of the response and is afforded the option to update their review. Hence, your decrease in search impressions volume can signify that your competitors are better utilizing their subtitle and/or better managing their ratings and reviews. For more information, read this! Since the app title is shorter and the subtitle is now an asset for search optimization, your entire keyword optimization strategy should be rethought. It is also important to pay close attention and stay on top of your ratings and reviews. The click-through rate (CTR), within the context of search traffic analysis, is the ratio of users who click on your app in the Search Results Page to the number of total users who view your app in the Search Results Page. Why Do We Predict Your CTR Will Be Affected by the New iOS 11 App Store? Since users are exposed to much more information on the Search Results Page (i.e., an additional portrait App Preview video /screenshot, videos that play automatically, and an additional app in the First Impression Frame), they have less motivation to click through to the Product Page to make the decision to install. Hence, you may see a decrease in the CTR. The CTR has the potential of increasing because now that there is an additional App Preview video /screenshot within an App Frame and now that the App Frame has shrunk in size, these images appear much smaller. The smaller App Frame combined with the additional App Preview video /screenshot, can make it harder for users to see details and decipher messaging. Therefore, your creatives and the orientation of your Gallery (portrait or landscape) can negatively impact your CTR. For best practices on Gallery orientation, read this! Below the line graph that shows CTR per iOS version, there is a table that details Impressions, Product Page Views, and Ratio. Use these figures to create your own table like the one below. In the example above, we can see that iOS 11 caused a decrease in the CTR. If you have seen no change in CTR, this is likely a result of not taking advantage of all the opportunities available on iOS 11 to increase your CTR (e.g. leveraging changes made to the Gallery). For more information on how to test these assets read this, this, and this! If you have seen an increase in CTR, we hypothesize this is a result of having images that are too hard for the user to read in the Search Results Page. We recommend trying to produce and test creatives that are more legible in the Search Results Page. If you have seen a decrease in CTR, we hypothesize this is a result of the fact that there is more competition in the Search Results Page. You should focus your optimization efforts on sticking out from your competitors both in designs and your unique selling proposition. Try testing a panoramic Gallery that focuses on your main unique selling proposition. 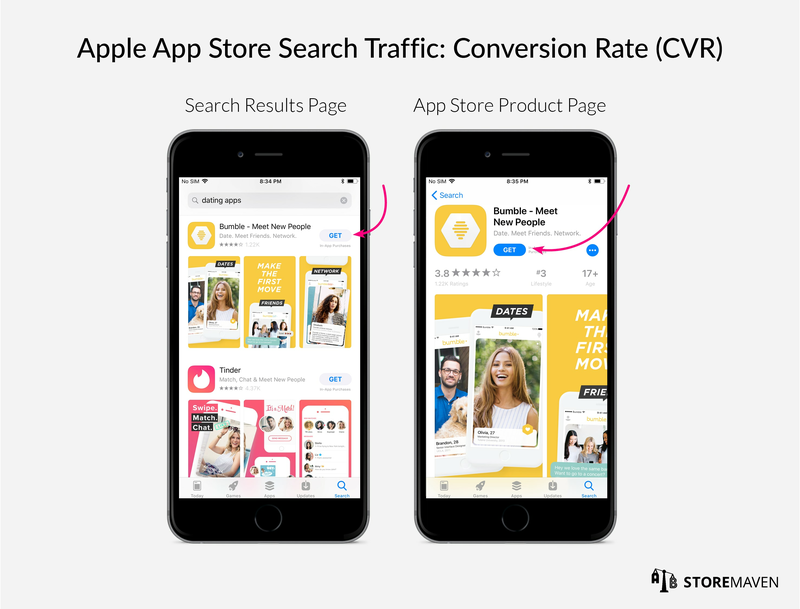 Conversion rate, within the context of search traffic analysis, is the total number of users that downloaded your app on either the Search Results Page or the Product Page. Why Do We Predict Your CVR Will Be Affected by the New iOS 11 App Store? Significant changes have been made to both the Search Results Page and the Product Page that have the potential to impact CVR. For a more detailed review of changes made to the iOS 11 App Store and their implications on CVR, read this! Below the line graph that shows CVR per iOS version, there is a table that details App Units, Product Page Views, and Ratio. Use these figures to create your own table like the one below. In the example above, iOS 11 caused a decrease in the CVR. *Note that since your app can be downloaded both from the Search Results Page and the Product Page, CVR tends to be higher than 100%. There is no way to filter downloads made on your Product Page alone. 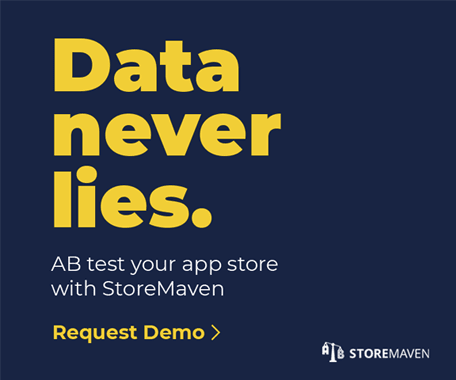 Since there is no way to filter downloads made on your Product Page alone, the only way to truly understand the impact iOS 11 has on your conversion rate and pivot your ASO strategy accordingly, is by using our A/B testing platform. Our platform mimics your App Store Product Page and enables you to test different marketing assets and measure user behavior. That means you will be able to understand the exact implications of the iOS 11 changes made to your iOS 11 Product Page (i.e., App Ranking, Editors’ Notes, What’s New, and video autoplay). You will also be able to understand how to best utilize your marketing assets to increase your conversion rate. Say you have an app with a high App Ranking. Your high rank acts as an element of social proof in and of itself. Therefore, you should take advantage of your First Impression Frame to convey a different message. That is, instead of utilizing other marketing assets to talk about the fact that you are the #1 app, you can focus your messaging on your unique selling propositions. If you have an app with a low App Ranking then you want to emphasize more social proof in your messaging (e.g. use a Gallery asset to say, “trusted by more than 1 million users”). Read this for a more detailed account of these performance tests and visit here to request a StoreMaven demo. Want proof these tests and our platform works? Read our latest case study! 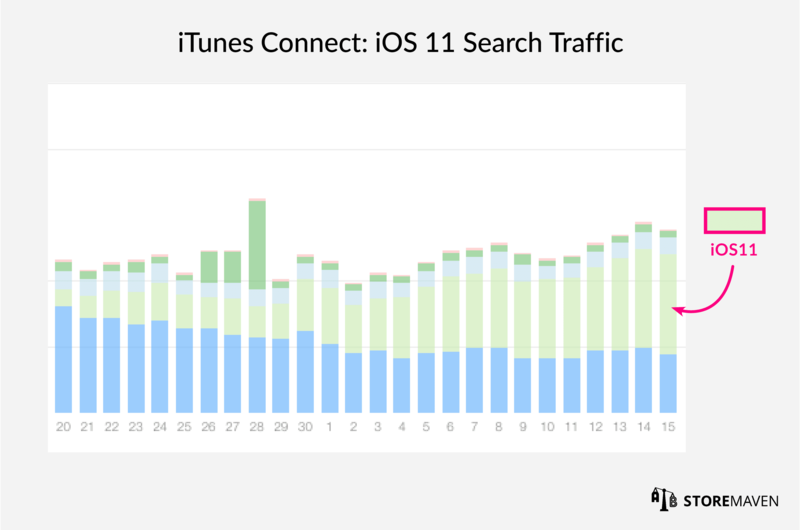 The only way to know how iOS 11 has impacted your app marketing performance is by using iTunes Connect to break down your traffic sources (i.e., search traffic, browse traffic, and referral traffic) for analysis. 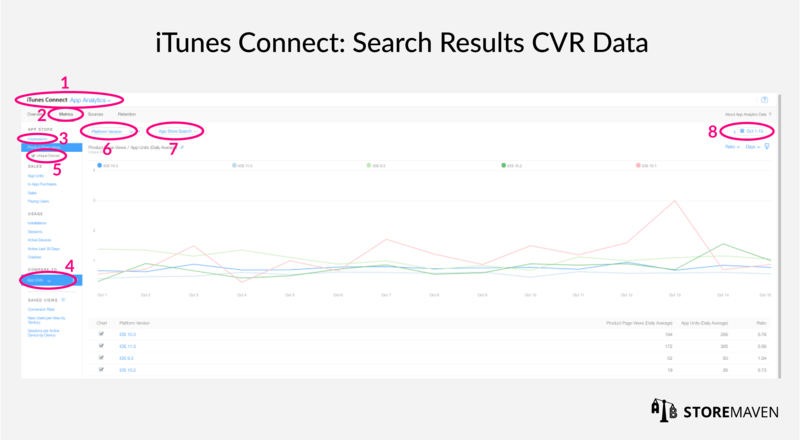 The most important metrics that should then be analyzed on iTunes Connect include impressions, click-through rate (CVR), and conversion rate (CVR). From there you will be able to use iTunes app analytics to see precisely how the iOS 11 App Store has impacted your app marketing performance and, in turn, pivot your App Store Optimization (ASO) strategy accordingly. Now that you know exactly how to use iTunes Connect to collect and analyze your search traffic data, it is time to do the same with your browse traffic and your referral traffic. Be sure to bookmark this page now as Part 2 and 3 of this serial post is expected to be published in the coming weeks. This article was co-authored by Shira Leffel and Helit Yair Pur. You have pretty much taught me all I need to know about finding data and statistics for iOS 11. Any business or franchise that has an app, is affected by the new app store. I didn’t even know iTunes Connect existed! Thanks for sharing such an informative post. Really helpful.